Attic mold is just as common as basement mold, but much easier to miss. when moisture forms on the outside of a cold drink on a warm humid day. 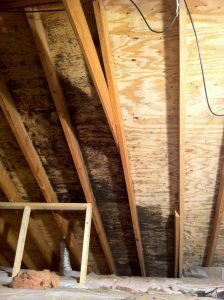 This combination of moisture and wood provides the perfect setting for attic mold growth. Attic mold starts as a white or gray fuzzy growth and can spread quickly. During the coldest part of winter or hottest part of summer, it goes dormant and turns black. When optimal growing conditions return, the dormant mold will come alive again and start growing and spreading. Attic mold can actually cause serious health and structural problems. The physical effects of mold exposure depend on your own health situation as well as the amount of mold you are exposed to. Symptoms of mold exposure can include coughing, wheezing, headaches, asthma and throat irritation. Additionally, excessive mold growth and improper ventilation can wreak havoc on roofs and ceilings. Now this might sound pretty dismal, but fear not! A variety of mold removal solutions exist to treat both the mold and the underlying issue. Attic mold removal methods include applying disinfectants, scrubbing with fungicides, and even total removal of the affected components. Dry ice blasting is another extremely effective and non-destructive mold remediation method. When the PBS team from the TV show This Old House encountered attic mold problems they call on our mold removal expertise. 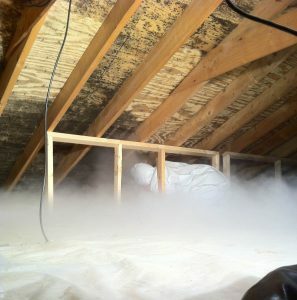 The video demonstrates the dry ice blasting method to remove attic mold. The dry ice blasting process consists of a compressed air gun that blasts rice-sized dry ice pellets at high speeds. When the dry ice strikes the surface, it goes directly from a solid to a gas. The transition causes the particles to expand up to 800 times their original size, and this rapid expansion beneath the mold contaminant forces its removal from the surface. The airborne particles are then removed by the use of HEPA filtered negative air machines. Once the attic mold has been taken care of, it’s time to repair any complications that triggered the growth. Treating the mold is important, of course, but fixing the primary issue causing the mold to grow is key to maintaining a healthy home. This can be anything from poor ventilation to a leaky roof. Here at Alpine, we don’t only remove your mold issues, we determine the root cause and work with you to prevent future attic mold growth. Got attic mold? Contact us to get rid of your mold problem!